When EJ and I were first married we bought a used TV. It was in a nice large (and heavy) cabinet and we thought it would look nice in our apartment. Well, we soon found out the reason it was traded in…the picture wouldn’t remain still. It would flip over and over, either vertical flips or horizontal flips. It had some adjustment knobs to correct the vertical and horizontal hold and it worked some. But I would get up, go to the TV, make the adjustment, get the flipping stopped–only to have it begin again before I got back to my chair. It was very frustrating to say the least. We had it worked on by the TV repair man. He put in new tubes (this was when TVs and radios had tubes) and it helped for a little while, but soon it was back to its old tricks. I thought about this old TV the other day while reading the passages in 1 John about love for God and love for the brothers. Especially 4:20, “If anyone says, ‘I love God,’ yet hates his brother, he is a liar. For anyone who does not love his brother, whom he has seen, cannot love God, who he has not seen” (NIV). John talks about a vertical love for God and a horizontal love for our brothers and sisters in the faith. Notice that if we sever our love for God, we also sever the love for our fellow man; and if we sever our love for our fellow man, we automatically sever our relationship with God. Both our vertical (with God) and horizontal (with our fellow beliervers) must remain intact. I guess all this comes to my mind when I see how shabbly we Christians treat one another. Jesus, in John 17, says that if believers are one with Him and with one another, then the world will be able to make the judgment that Jesus was sent by God to this world. It just seems to me that we struggle with this “love business.” It doesn’t mean that believers can’t disagree over issues, but it does mean that their interpersonal disagreements are handled differently than the world handles them. I am amazed how believers talk to one another with such anger. Where is God in all of this? Sometimes we treat our fellow believers as if they are the enemy. They are not the enemy! Satan is the enemy and he has a field day when he can influence us to turn on one another. Christians that don’t speak to other Christians–this cannot be in the Body of Christ. Christians who carry bitterness toward another Christan–this cannot be in the Body of Christ. If Jesus, while hanging on the cross, could forgive those who put Him there, surely we ought to be able to forgive one another. How many churches have lost their testimony in their community because the members harbor bitterness against other believers in their church? If the love of Christ compels, then the anger/bitterness of Christians for one another certainly repels. Let’s take some time to check our vertical and horizontal holds (relationships). You may not like me (an emotion), but you have to love me (an act of faith)! Jacob Stover, a long-time minister in Pennsylvania and Mid-Atlantic conferences, passed away Thursday morning, February 24, at 11:15 a.m. There will be no public viewing and service. Instead, the family has chosen to have only a private memorial service. However, this service is open to Rev. Stover’s ministerial colleagues. Faith Church in Port Orange, Florida lost their multipurpose building in one of the hurricanes last year. They currently have approved plans, and even have a local contractor who will pull permits on his number, but neither he nor others in the area have time to send a crew to build it. They are either already committed to other projects or are on the Gulf Coast assisting rebuilding efforts there. They are looking for a General Contractor who will either bring a crew to do the construction or a retired or semi-retired GC who would come supervise and allow them to hire subs and a crew there. The building is a straightforward 2500 square foot concrete block building, single story. Cluster leaders, please make sure all your churches are aware of this opportunity. Thanks. To be licensed in the UB Church, every candidate needs to take the UB History course. It is being offered this summer at Huntington University. Please get this info to every person associated with your cluster’s churches who needs to take the course. COST: $250 for course. Housing on-campus provided at a nominal cost. Course will be completed that week. No papers or projects to complete afterward. For more information or to apply for the course, contact Lori Garde at the Graduate School of Christian Ministries. Recently I was challenged to a full orbed view of the Great Commission. Since we are covenanting together to be “Great Commission” churches, we must have a full view of what that entails. The front side of the commission is to make disciples. We know that this is the dominant verb in the sentence. It is also a command. Disciples are not “converts” if by converts we simply imply an evangelistic decision by someone. Disciples are on a life pursuit. Disciples are learners who are growing in grace and knowledge of the truth. Disciples are lovers of God and people. Disciples are passionate about doing what Jesus did, invading the world to “seek and to save that which was lost.” The “going”, “baptizing” and “teaching” are all supportive parts of the making of disciples. Some churches practice an evangelistic thrust that emphasizes people who make a “decision,” but they are left to fend for themselves about what it all means to follow Jesus. They would be like a seed that springs up quickly but is either taken away or burned away by the sun fairly quickly. Other churches seem focused on teaching, believing that if you teach your people truth, they will evangelize. Without an intentional plan to go “make new disciples,” these folks can become like the leaders of Jesus day who were ever hearing but not understanding. Right teaching which leads to right action will also lead to the giving away of truth. Is your ministry “full orbed?” What do you do to intentionally speak into the community and culture around you with the Gospel of Jesus? Who have you spoken to personally in the past weeks? And are you continuing to “teach everything He has commanded?” Are your people maturing in their faith to where they can’t help speak of what they have seen and heard? Holding onto the Gospel of Jesus Christ (revelation) and intentionally seeking to save that which was lost (relevance) will help keep our ministries aligned with the Great Commission in all its fullness. On March 31, five persons will travel to Cuiaba, Brazil, to assist endorsed UB missionaries Wes and Jean Bell (right) with a Spiritual Emphasis Retreat for students at the mission school where the Bells serve. Donna and Jason Hollopeter, Isa Rivera, Diane Sayles, and Nancy Shearer will help teach and mentor students of all age groups. The group will spend time not only with the Bells, but with fellow Wycliffe missionaries Dave and Becky Spencer, and will discuss ways future ministry groups could assist these missionaries. 14 Feb Roses are Red. Don’t Forget! I wish I had some snappy two-line ditty to finish this little poem to wish you all a Happy Valentines Day! But alas I am no poet and “my big feet show it” (and they are big if you need to know it). Well enough of that stuff. I just wanted to remind you to send an expression of love to the “lover of your soul,” to the one who loved you so much He died so we might live, to the one who promises us an eternal home that He personally is preparing, to the one who blesses with every spiritual blessing in the heavenlies, to the one who has promised to never leave us or forsake us, to the one whose love is not fickle, based on how He feels, whose love does not change…. I suppose the perfect Valentine for such a one is to give Him my obedience which he desires even more than my sacrifice. And I almost wish He hadn’t said that, because giving a sacrifice is much easier than obedience. At least, that is the way it is in my life. So the question for this Valentines Day is not what I can do for Him, but rather will I be obedient to Him. Oh yes, and don’t forget your earthly sweetie either! Dan Wust, endorsed missionary with the UB church, worked in partnership with Global Ministries in December 2005 doing leadership training with Nicaraguan pastors and lay leaders. He taught inductive Bible study, and its application to preaching and teaching. Jamaica Conference will hold its annual meeting March 15-19. Gary Dilley (Director of Global Ministries) and Pat Jones (Director of Healthy Church Ministries), along with their spouses, will attend the event. Rev. Jones will lead several training presentations on church health. The event will include the election of all major offices, including General Superintendent. They will also work on updating their ten-year ministry plan. A major thrust of Jamaica Conference is to acquire additional land for church planting in the following areas: Iterboraele, Rhymesbury, Cockpit (Longville Park), and Eltham Park. They are also purchasing land at their church camp, Malvern. On the Sunday following the conference sessions, all UB churches across the island come together for a large combined service near Mandeville. Superintendent Winston Smith (left) and the conference leadership will challenge those gathered to give generously toward making this dream come to pass. Pray that God’s people will be moved to participate. North American churches have been asked to consider working in partnership on this project. Gary Dilley, Director of Global Ministries, and his wife Rhonda are celebrating the birth of their first grandchild. 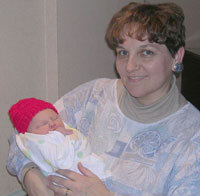 Brooke Alexandria Dilley arrived on February 11 at 1:30 a.m., weighing 6 lbs., 15 oz. Everyone is doing fine. That’s Rhonda in the picture holding Brooke.